Funded by International Alert, the project avails relevant information and creates space for the citizenry, leaders and academia to freely debate and discuss issues of oil and gas. When in 2006, the government of Uganda confirmed commercially viable oil deposits in the Albertine Grabben. In 2012, the Ministry of Energy and Mineral development announced that 90% of appraised wells were successful and the expected barrels per day would also increase from 5 billion to 9 billion barrels. Little did they know that the rate of success would exceed what they had anticipated. Ever since, Ugandans believe that potholes on Uganda’s roads will be no more, lining up for hospital services and the general infrastructure will improve, trade and commerce will boom, and lives of Ugandan’s will generally be transformed. A blessing indeed if well managed a curse if mismanaged!! By 2011, public knowledge about the oil and Gas sector in Uganda and the Rwenzori region was averagely low. 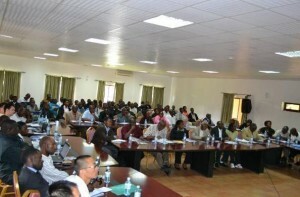 That is about 20% of the local leaders and citizens were aware of what takes place in the Oil and Gas sector. With Financial support from International Alert, KRC has since 2011 been implementing an oil and Gas Project-Making Oil and Gas Information into the Public Domain. The idea of the project is to improve the level of public and Leadership awareness and capacity to effectively engage with the debate in the Oil and Gas Sector.